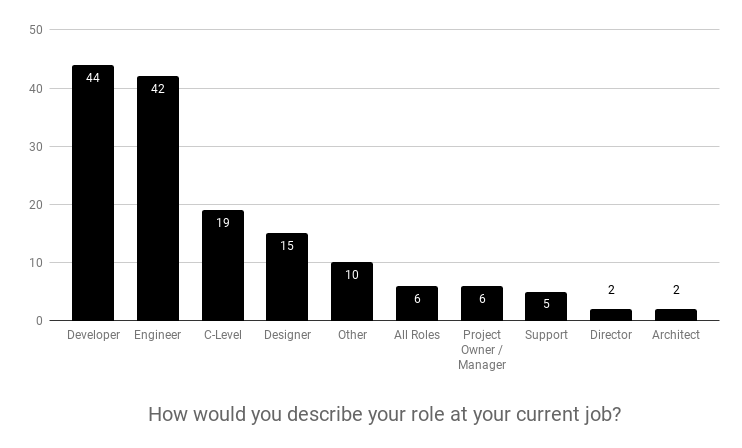 Prior to the release of WordPress 5.0, I conducted a survey asking WordPress users with Gutenberg experience to offer their perspective on the new editor. The survey was conducted as part of a broader user-research effort designed to understand more about how content publishers view page-building and site-building tools, and how the new content editor matches expectations. This research was intended to explore the behaviors and opinions of people who had already tried Gutenberg. Updates to the new editor based on this research are being tracked on Github and MakeWordPress.org. 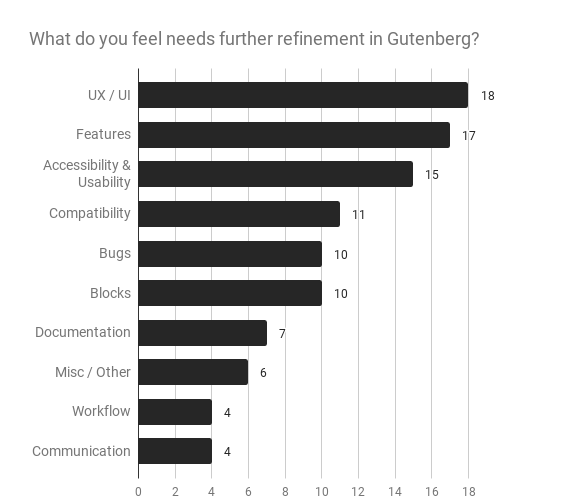 Participants were asked seven open-ended questions about their experience with Gutenberg. The survey was intentionally designed as open-ended to gather a breadth of answers and to avoid biasing ourselves with expected responses. The goal was to make it feel like an unmoderated questionnaire more than a survey with finite choices. Out of 161 initial survey participants, 4 did not qualify based on screening criteria. The study required experience working with WordPress and at least some experience with Gutenberg. How would you describe your role at your current job? What lessons, if any, did you learn from Gutenberg phase 1? What do you feel needs further refinement in Gutenberg? What areas of focus should be considered for phase 2 of Gutenberg? Do you have any worries about Gutenberg? If so, what? Do you have any hopes for Gutenberg and its future? If so, what are they? Who do you feel are the most important WordPress users to consider for the next iteration of Gutenberg? Would you like to add anything else about Gutenberg? Survey responses show that overall, the promise of the new editor was generating excitement. The open-ended format allowed participants to respond as though it was a post-project retrospective. Some expressed enthusiasm that new audiences considering WordPress will have a modern editing experience. Criticism coalesced around a few themes. In particular, while participants acknowledged Gutenberg’s potential, they also felt that a lack of refinement detracted from successful early adoption. This issue was exacerbated by a perceived lack of communication and visibility into features and release timelines. Some participants acknowledged that gaining 100% consensus is not feasible, especially within an open-source project with a community as large and far-reaching as WordPress’s. As one person said, “Shipping new features in core is hard.” Still, it became clear that a feeling of not being heard contributed to some backlash. Visibility concerns created anxiety and fear for some, particularly those who worried what the impact would be for their projects or clients. Participants often requested more documentation so they could help their clients with the editorial transition. Participants felt that poor communication decreased overall adoption. Participants wanted to understand the roadmap and key project dates. Uncertainty and “unknowns” caused anxiety. This anxiety manifested in survey responses. Many were concerned that Gutenberg was leaving behind people with disabilities and by not making the new editor accessible to all, causing a decline in WordPress use. The Accessibility team is chronicling their work if you would like to follow their updates. Generally, it seemed participants believed the new editor is headed in the right direction but needed more finesse. At the time of writing, WordPress 5.1 has already been released, bringing several updates and refinements. You can follow a weekly digest, and you can follow accessibility updates on Make WordPress. Another survey is recommended to gauge changes in perception following the official launch of the new editor. This test is scheduled to be conducted close to the one-year anniversary of the WordPress 5.0 release. Speaking of surveys, I’m currently conducting research to learn more about how writers and editors use their smartphones when writing, publishing, and updating a website. If you currently write and publish for the web we’d love to hear from you!